Want to experience total freedom ? Discover the sensation of flying like a bird, soaring like an eagle. 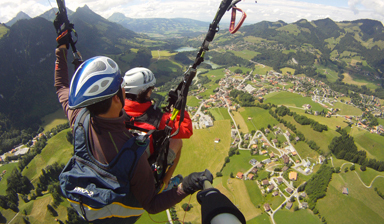 On a maiden paragliding flight, you will be in the air for ten minutes. During this activity there will be no thermals, no special tricks, just the pure joy of flying, like in Icarus’ Dreams. This package is suitable for anyone from the age of 8 upwards, and is available throughout the year, 7 days a week. During the winter season, you can bring your skis on the flight if you like. Alternatively, you can simply walk here, since even in the winter skis are not required. This short trip is also designed for those wishing to experience paragliding for the first time without spending too long in the air. This flight is fittingly named “Icarus’ Dream”. We also do maiden flights for groups, supplying more pilots so you can all fly together. Your pilot will take you into the skies above the lush, green countryside of Gruyère, in total safety, for a maiden voyage you’re sure to remember for a long time. Enjoy your flight!